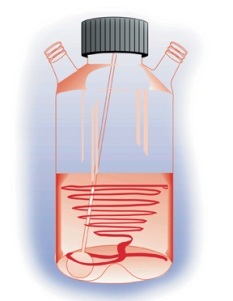 The culture vessels can be sealed for use with pathogenic materials. The stirrer rod design eliminates rotating bearings within the culture vessels, avoiding the difficulties arising from attempts to clean and autoclave conventional vessels. The stirring system uses Pyrex® borosilicate glass culture vessels and stirrer rods which are siliconised to reduce the possibility of cells attaching to and growing on the surfaces. 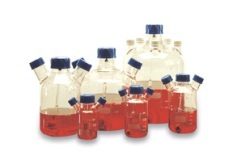 Vessels are available with nominal working volumes of 125ml, 250ml, 500ml, 1 litre, 3 litre (all with two side necks) and 5 litre (with two or five side necks). Please note: 3L and 5L glass vessels are no longer available to order.